Are you searching for ways to boost your young or struggling students’ word recognition skills? A systematic and explicit approach to phonics instruction can help! As teachers, I strongly believe, we need to have as many effective strategies as possible for reaching and teaching all of our students. Given that approximately 84% of words in the English language are phonetically regular (at least for reading), systematic and explicit phonics instruction needs to be one of those strategies. What Does the Research Say About Phonics Instruction? Research in the 21st century consistently supports systematic and explicit phonics instruction. It is more effective than non-systematic or no phonics instruction. It leads to significant improvement in word recognition and spelling skills, particularly for kindergarteners and first-graders. It is most effective when it starts in kindergarten or first grade. It provides significant benefits for preventing and overcoming reading difficulties. Systematic and explicit phonics instruction is not the whole enchilada of reading. It should be one component of a program that also includes phonemic awareness, reading fluency, vocabulary and reading comprehension strategies. How Should I Teach Phonics? Phonics instruction can be implemented in several ways including synthetic, analytic, and analogy-based approaches. In synthetic phonics, students are taught letter/ sound correspondences and how to blend sounds to form words. Orton Gillingham based programs are an example of a synthetic phonics approach. Keywords/ pictures are often used to learn the letter-sound relationships. In analytic phonics, students analyze the letter-sound relationships in known words. Word study is a prime example of this approach. In analogy-based phonics, students learn keywords with spelling patterns (rimes) and use words they know to read unknown words. UThink provides an explanation of this approach. I used one or more of these instructional approaches at all times throughout my teaching career. Most children will benefit from consistent instruction using any of these. Some children will learn more easily with one approach over another. The trick can be figuring out which approach or which blend of approaches works best for each child! 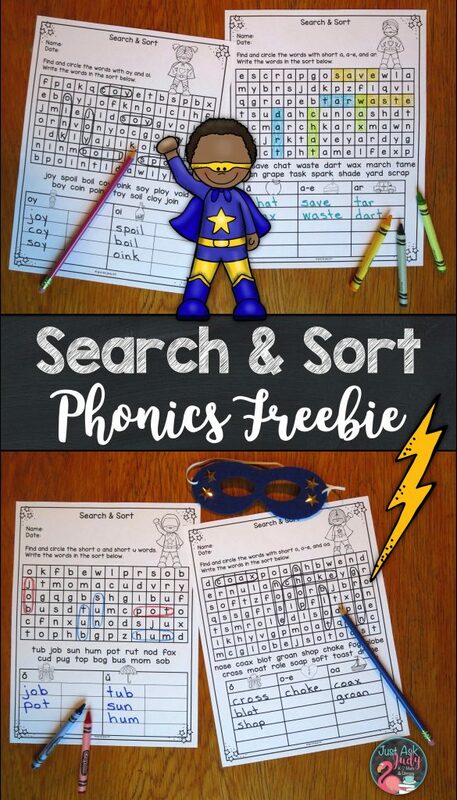 I recently updated my systematic and sequential one-syllable word lists with a superhero theme to include color and black/ gray/ white combined in a single resource with an easier to prepare format. 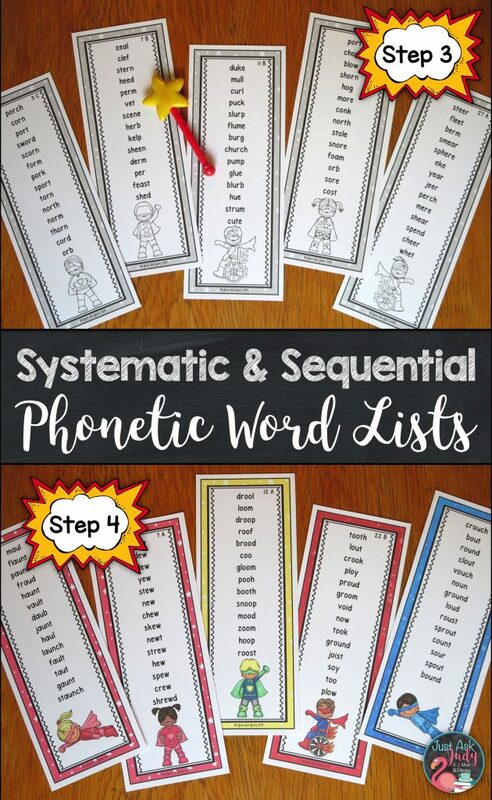 I created these as an attractive and underwhelming alternative to the lists of words commonly found in synthetic phonics workbooks. 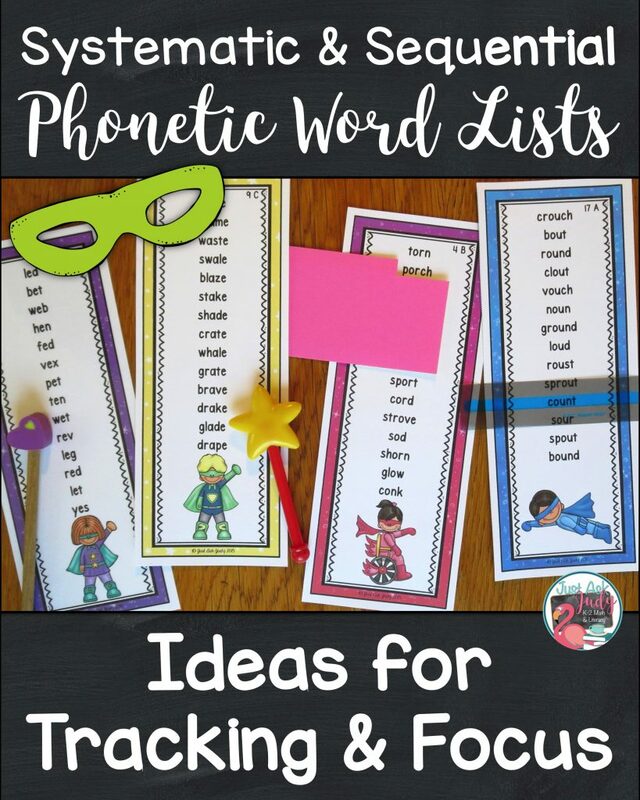 Some of the ways you can use these lists include for tutoring, for a warm-up with a small group of students, or for buddy reading to help develop fluency. In a small group, all students can whisper read while you listen in on one student at a time. These are also a handy resource for substitutes, assistants, volunteers, and parents. “Will be sending these home for extra reinforcement in decoding” Carol B. These lists have been carefully sequenced to provide ample decoding practice in a systematic way. Each vowel sound is typically introduced in isolation in a word list and then integrated with previously learned vowel sounds before progressing to the next new sound. These lists are divided into four steps, which can be purchased individually or as a bundle. “Great resource for when you can’t seem to think of any more words that fit the word work pattern!” Emily N.
Some students may benefit from using a pointer, highlighter strip, or index card cut-out to keep their place and increase focus. The index card cut-out also works well for tracking text and can easily be adjusted to the font size. Be sure you have taught the vowel sounds for the lists you use. Post keywords and pictures, as needed, for easy reference. Always follow-up with reading an appropriate text and holding your students accountable for applying learned decoding skills. 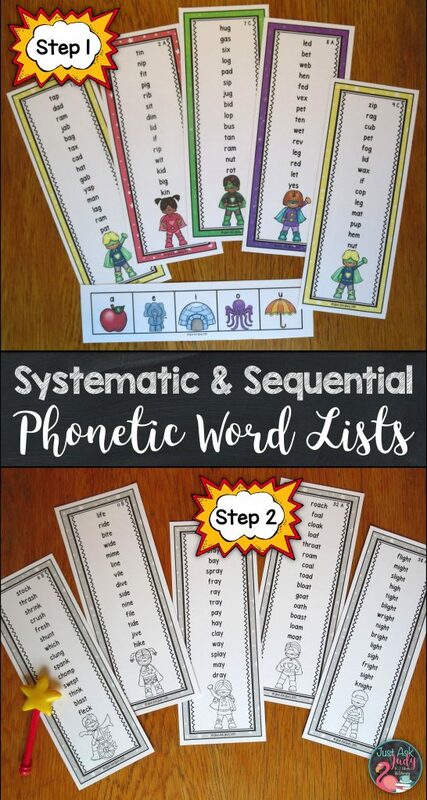 You can find these systematic and sequential word lists in the Phonics category of my Teachers Pay Teachers store at a special (re)introductory price of 20% off through October 6th, 2017. This includes the bundles for extra savings! I also crafted four free “search & sort” print and go pages. There is one for each step, along with an answer key. These are great for any type of independent work: morning, seat, center or home. It’s important, whenever possible, to have your students read (at least to spot check) the words in their sort to you, an assistant, volunteer, peer buddy, or parent. To make these searches easier for all, the words go across or down only, no diagonal or backward words. 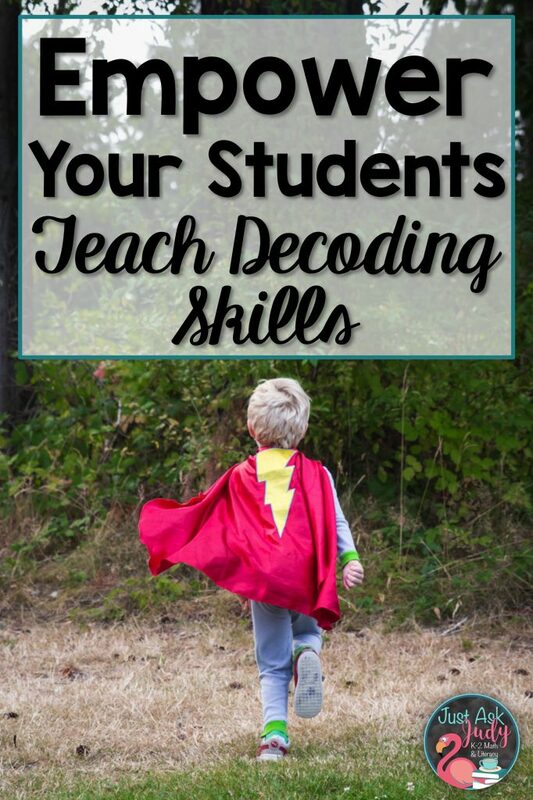 I’d love to hear about the resources you find most effective for teaching decoding skills and those you wish you could find!